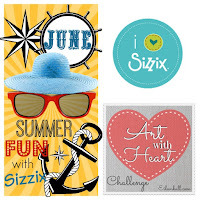 I've been wanting to make a project for Eileen Hull's Art With Heart Challenge - Summer Fun with Sizzix. I have several of Eileen's Sizzix dies and I've been waiting to find time to make things with them. I used an empty shrimp cocktail jar to put the flowers in- it slipped nicely into the canister! 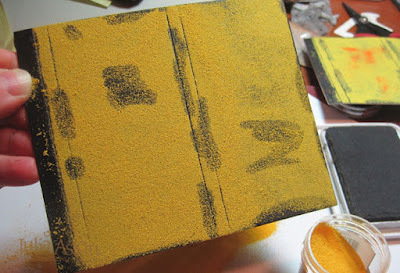 I embossed all the pieces with Wendy Vecchi's Buttercup Embossing Powder - brushing some of it off before embossing to age it. I also rubbed it off the edge that I would be putting ScorTape on to put the pieces together. After I heated the yellow - I sprinkled a little bit of Tiger Lily Embossing powder on and heated it again. 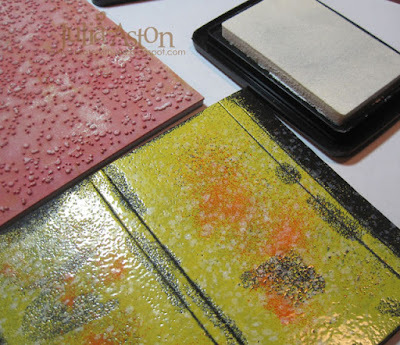 When the pieces cooled - I stamped Wendy Vecchi's Spatter stamp using Adirondack Snow Cap. 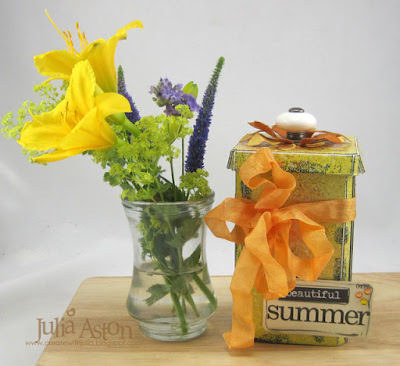 I die cut some Tattered Florals out of Coredinations Ranger Distress paper - sanding the edges, sponging with Ranger Distress Vintage Photo and crushing up each bloom in my palm and then unfolding. 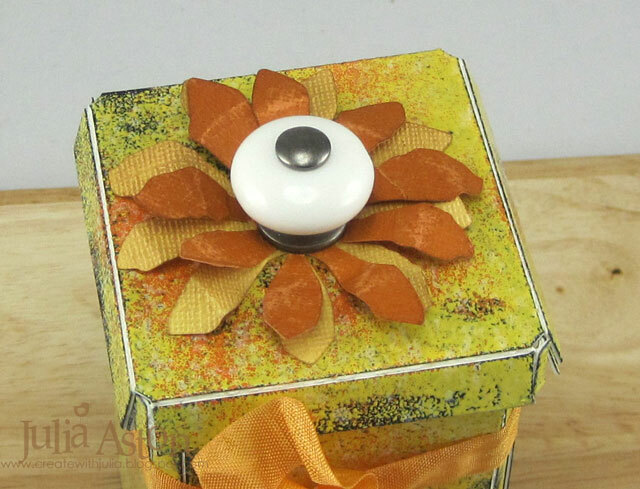 I used an Idea-ology Curio Knob on the cover. I wrapped a piece of wrinkled seam tape around the canister, tying it in a double bow. And to finish it off I adhered an Idea-logy Flash Card with a Big Chat sticker on it and 3 rhinestones. I drew frames around the sticker and card with a black Stabilo pencil and rubbed it with my finger to soften. 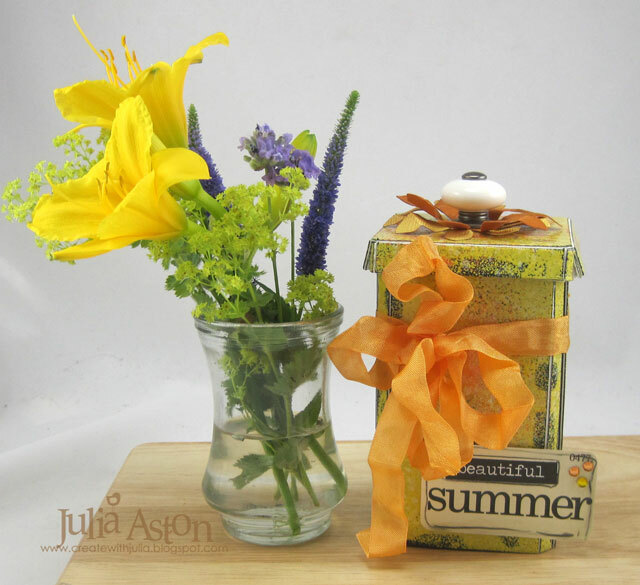 I love my summer canister/vase - it's like a ray of summer sunshine inside the house! 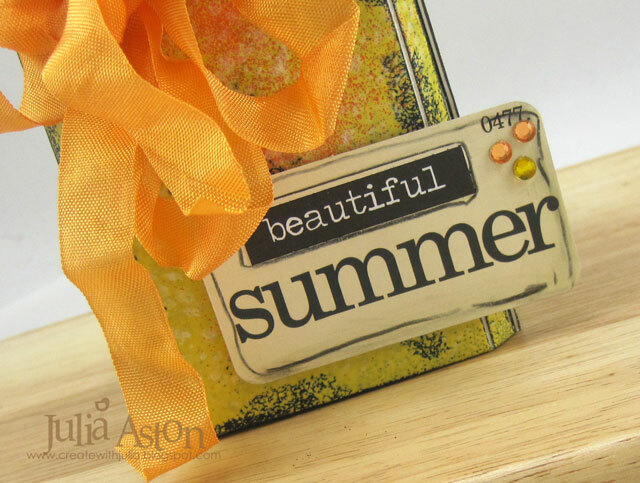 Paper: Little Sizzles Black Matboard - Sizzix, Coredinations/Ranger Distress. Ink: Wency Vecchi Archival Watering Can, Ranger Distress Vintage Photo, Adirondack Snowcap. 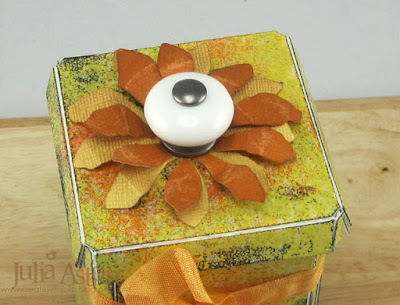 Accessories: Dies - Canister/Eileen Hull/Sizzix, Tattered Florals - Alterations/Tim Holtz, Idea-ology - Curio Knobs, Flashcards, Big Chat, Stabilo Black Pencil, rhinestones - Kaiser, foam dots, ScorTape, wrinkled seam tape - Prairie Bird Boutique Etsy Shop. 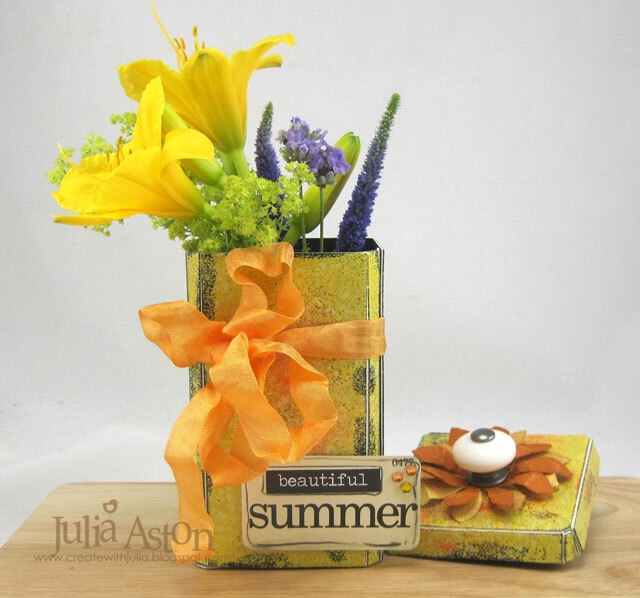 oh my that is incredible.. awesome.. awesome..
Gorgeous ensemble Julia! So fun and creative! 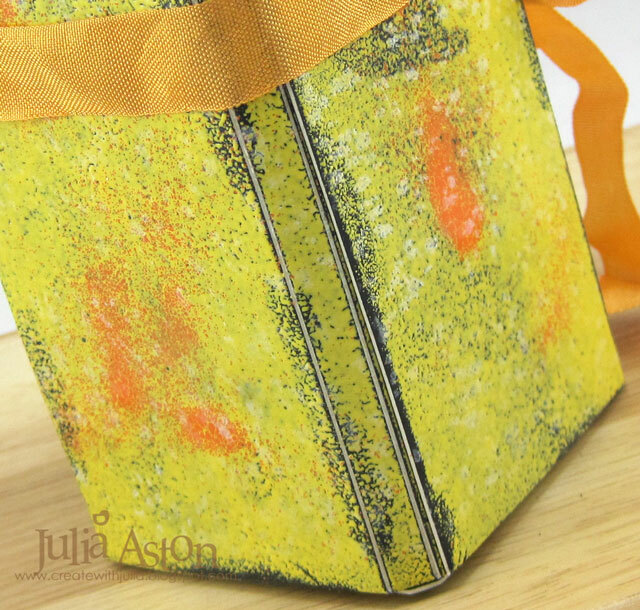 Love all the embossed details! What a beautiful shiny project, thank you for the inspiration!! very cool!! I love what you did with this project. 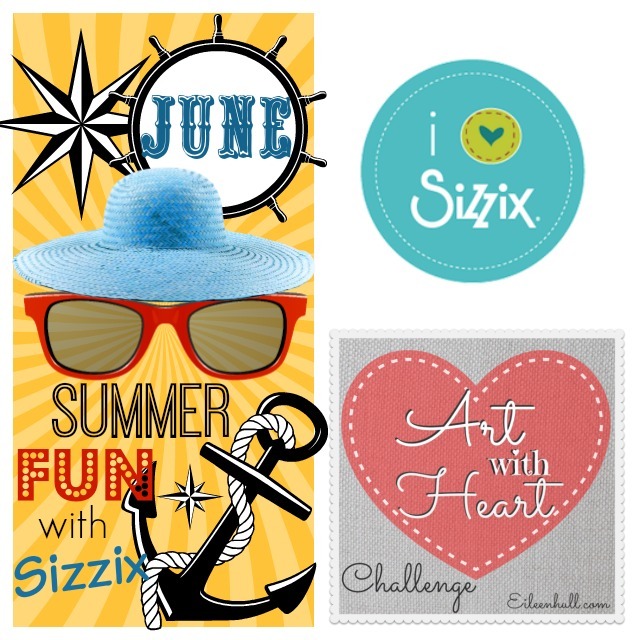 =) Thank you for sharing it with us in the Art with Heart Challenge this month! wow Julia- love how the black matboard looks with yellow embossing on top! 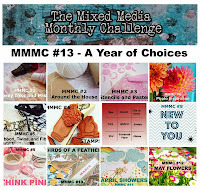 Great idea and thanks for joining us on the Challenge this month! Well done! 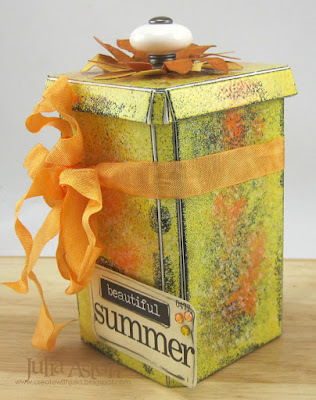 This make a fabulous container for flowers and is perfect for Eileen's Art with Heart Challenge! Great work and good luck! very pretty! what a great die to have and love what you created with it. 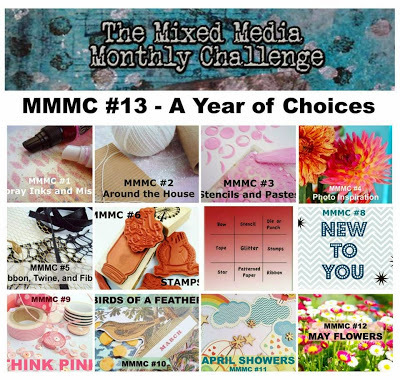 Thank you so much for playing with the Mixed Media Monthly Challenge and celebrating our first birthday!! congrats on your win!! so glad you shared with us! !